Lebanese women hold placards supporting the outgoing Lebanese Prime Minister Saad Hariri to return from Saudi Arabia during the Beirut Marathon in Beirut, Lebanon, Nov. 12, 2017. Thousands of Lebanese taking part in the country's annual marathon used the event to call on Prime Minister Saad Hariri to return home after he resigned under mysterious circumstances during a visit to Saudi Arabia. 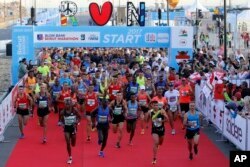 Hariri was a regular participant in the marathon, giving the international sports event a big boost. This year, President Michel Aoun had encouraged runners to call on Hariri to return. Many Lebanese suspect he was placed under house arrest as part of a Saudi plan to unravel a coalition government he had formed with Hezbollah last year. A dual Lebanese-Saudi national and an ally of Riyadh, Hariri unexpectedly announced his resignation on Nov. 4 in a pre-recorded message broadcast on Saudi TV, criticizing Iran and Lebanon's Hezbollah militant group, and saying he feared for his safety. His father, former Prime Minister Rafik Hariri, was killed by a car bomb in Beirut in 2005. His family lives in Riyadh. Spectators along the 26.2 mile (42.2 kilometer) course wore hats and held signs reading "Running for you" and "Waiting for you." Large billboards with pictures of Hariri rose overhead, and a local TV station re-aired an hour-long profile and interview with Hariri recorded last year. Runners compete in the Beirut Marathon, Sunday, Nov. 12, 2017. Absent from the marathon this year is the outgoing PM Saad Hariri, a regular participant, who resigned from his post unexpectedly last week while in Saudi Arabia. Ibrahim al-Masri, a 37-year-old Hariri supporter, said the Lebanese don't know if the prime minister is staying in Saudi Arabia by choice. "Whatever he chooses, we are with him. We want him to first come to Lebanon. We will die for him," al-Masri said. Joanne Hamza, a physical education teacher who was wearing a cap with a picture of Hariri on it, said he was missed at the race. "But in a sense, his absence has been unifying. All Lebanese, from all sects, are missing their leader. This is somehow reassuring but we still want him with us." Saudi Arabia's King Salman bin Abdulaziz al-Saud meets with former Lebanese Prime Minister Saad al-Hariri in Riyadh, Saudi Arabia, Nov. 6, 2017. Aoun called on Saudi Arabia Saturday to clarify the reasons why Hariri has not returned home since his resignation. "The obscurity regarding Hariri's conditions makes anything that he says or does not reflect truth," the president said. "It was a shock for the country, and already the country was suffering economically," said Ziad Zakka, a 52-year-old engineer who took part in the race. "Nobody knows what the future will hold for Lebanon so we need to have him back as soon as possible before it's too late." Samir, a 42-year-old banker, was running with his 11-year-old son. He said he fears for his children, and has already stocked up on formula for his new baby. He accused Lebanon's politicians of allowing foreign interference, and asked that his last name not be used for fear of repercussions. "We are tired of wars. We don't want our land to be a place to settle scores and wage wars. It is enough. Have mercy." Organizers say more than 47,000 participated in the marathon. Separately in the northern city of Tripoli on Saturday, in a sign of rising tension, unknown assailants burned posters of Saudi Crown Prince Mohammed bin Salman. The interior minister, Nohad Machnouk, tweeted that those acts did not reflect the "`true feelings" of the people of Tripoli or Lebanon, and called for the perpetrators to be brought to justice.